By Keith Cowing on March 20, 2018 3:17 PM. Keith's note: This letter was circulated by Rep. Babin and was signed by 61 members of the House - 12 of whom are Democrats. This would certainly seem to undermine Sen. Nelson's contention that Jim Bridenstine would be too political. "We are keenly aware of how valuable NASA is, not only to our nation, but also the entire world. It would be a travesty to America's space program for it to remain leaderless at this critical time when America's space industry is making rapid advances that will set the course of space leadership for decades to come. This is why it is vitally important that the Senate take up and approve Jim Bridenstine's nomination. Jim Bridenstine has spent the bulk of his adult life in service to his country. His background is in naval aviation, flying the E2- C Hawkeye in Afghanistan and Iraq, and later the F-18 while also serving as an instructor at the Naval Strike and Air Warfare Center. He has been responsible for coordinating command and control of the battlefield from an airborne platform, with thousands of lives and billions of dollars affected by his decisions. In this service to his nation he has demonstrated both the technical capacity and leadership experience necessary to lead NASA." 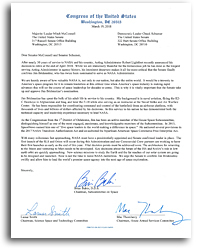 Letter From House Members to Senate Leadership Regarding NASA Administrator Nominee Bridenstine\n\n Keith's note: This letter was circulated by Rep. Babin and was signed by 61 members of the House - 12 of whom are Democrats. This would certainly seem to undermine Sen. Nelson's contention that Jim Bridenstine would be too political.\n\n\"We are keenly aware of how valuable NASA is, not only to our nation, but also the entire world. It would be a travesty to America's space program for it to remain leaderless at this critical time when America's space industry is making rapid advances that will set the course of space leadership for decades to come. This is why it is vitally important that the Senate take up and approve Jim Bridenstine's nomination. Jim Bridenstine has spent the bulk of his adult life in service to his country. His background is in naval aviation, flying the E2- C Hawkeye in Afghanistan and Iraq, and later the F-18 while also serving as an instructor at the Naval Strike and Air Warfare Center. He has been responsible for coordinating command and control of the battlefield from an airborne platform, with thousands of lives and billions of dollars affected by his decisions. In this service to his nation he has demonstrated both the technical capacity and leadership experience necessary to lead NASA.\"
This page contains a single entry by Keith Cowing published on March 20, 2018 3:17 PM. NASA Allows RTG Proposals Again was the previous entry in this blog. The Plight Of The Citrus College Rocket Owls (Update) is the next entry in this blog.